Thérèse M’Bissine Diop of Senegal, a pioneer actor in African cinema, is best known for her performance in the classic film, La Noire de… (1966) by Ousmane Sembene. Her only other role in an African film was as one of the anonymous women in quiet resistance in Sembene’s 1971 film Emitai. While she has had a relatively small presence in African cinema, her role as Diouana in La Noire de… looms large and has ensured her place in the annals of African film history, perhaps more specifically because of the historical importance of the film. Thérèse M’Bissine Diop studied acting at the Ecole des Arts de Dakar under Robert Fontaine, who had major roles in both La Noire de… and Emitai. She has also acted in several other films: Soleil noir (1970) by Alexi Pechniev and two films directed by her psychiatrist/ethnologist husband Maurice Dorès, Borom Xam Xam (1974) and Cap Manuel (1986). Even as she is recognized along side Zalika Souley as a pioneer actress in African cinema, the ostracism that she endured during that period in the late 1960s has left an indelible mark on her life. Women in cinema were viewed as loose and immoral, rebellious and uncontrollable—as if the roles they played were who they actually were. Presently Thérèse M’Bissine Diop uses her creative talents in tapestry making, a career that she embarked upon when moving to Paris in the late 1970s. Nonetheless, she is a visible spokesperson for African cinema and actively supports the initiatives organized to promote it. Her reflections during my conversation with her at the Racines Noires Festival in 1998 reveal the continued significance of her role as pioneer. 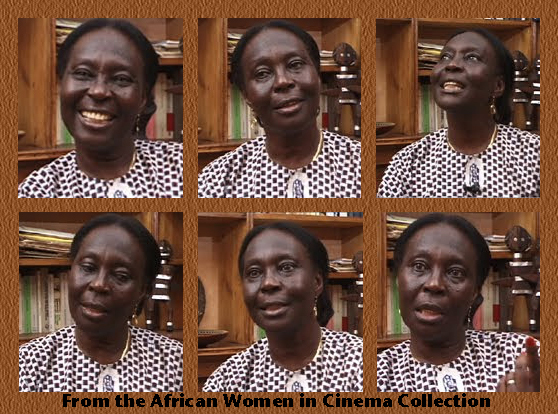 Thérèse M’Bissine Diop, your place as an actor is very important in the history of African cinema. During your career you played the role of Diouana in the film La noire de... by Ousmane Sembene. This film marks the first feature film of African cinema. Before this film, made in 1966, African cinema did not actually exist. Could you talk about this period? What was it like to be an actor in Africa at that time? In general, the milieu of cinema is very difficult. It was very difficult for me at that time. Oh, if I could have come in contact with someone then who could have assisted me…but no, there was no one! Even in the neighborhood where I lived, to see a black woman in the cinema! As I said, it was very difficult for me. After the film La Noire de..., when I passed by mothers in the neighborhood where I lived, they would turn the other way. Some people were also very critical of me. This period in my life coincided with the 66-68 period in France. Having just returned from France, I wore traditional clothing as well as clothing designed with the “Mao collar.” Of course, that did not help matters, for there were people who said that I had communist ideas, something which I did not even understand. There were those who also said that an African woman who acted in the cinema was a loose woman. Others loved the film, but I was highly criticized. People talked all around me saying, "That girl who acted in La noire de... is Sembene's woman, they are going to get married." They did not understand at all! In other words, having acted in the film people saw me as belonging to Sembene. It was difficult for me to understand this reaction. Even my own mother—normally a mother supports her child when the latter is in difficulty. However, in my own family, I did not get this, I was not given support. No one encouraged me. There were months that passed when my mother did not speak to me because of the film. How did you come to act in the film La Noire de...? How did you meet Ousmane Sembene? Did you do any acting before your role in La Noire de...? No, but I already had the idea. While I was in France attending tailoring classes, I told a friend that I wanted to join the army to be a parachutist. So, you see, I already had the idea that I wanted to do something different, and it evolved from that. My friend said, “I don’t see you either as a seamstress or as a parachutist, but rather as an actor.” I said, “Actor?” She said, “Yes, I see you as an artist.” Everything evolved from that moment. We contacted Josephine Baker. We wrote to her and she responded, I remember that very well. She sent me one of her photographs. She invited me to come to visit her, but I did not have money to do so nor anybody to help me get some. So at that time I could not really realize my dream. I could not accept any of the invitations that I received. However, this dream stayed with me; and when I returned to Africa, I enrolled in the Ecole des Arts de Dakar. After my sewing classes, I attended classes at the art school in the evening, from 5 p.m. to 9:30 p.m. I had a friend, Mariam Dembele from Côte d’Ivoire, who knew a photographer who worked at the Actualités Sénégalaises. He took pictures of both of us, and everything evolved from there. Ousmane Sembene saw my photograph and contacted me and then I began to work with him. Each time that I think about La Noire de..., I realize the impact that this period had on me. I think that if I had to do it again I would think more carefully. I just saw Black Girl and really enjoyed Diop's performance. She's just so beautiful and full of expression. I feel bad that she was treated so harshly at the time of the film's release, and I wish I could see more of her work.